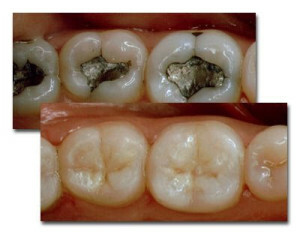 For nearly 200 years, dentists have been filling teeth with amalgam. Often described – wrongly – as “silver” fillings, these restorations are mostly made of mercury, a known neurotoxin that has been linked to a wide variety of systemic ills. Fortunately, we have much better options available today – nontoxic, biocompatible materials that are much more aesthetic, blending with your natural teeth. These include composite resins for “white” or “tooth-colored” fillings and ceramics such as zirconium for crowns. All the composites we use are BPA-free and fluoride-free. When sensitivity or reactivity is a special concern, we can do biocompatibility testing to ensure that the materials we use are a good fit with your unique biochemistry. Another benefit of composite is that we don’t have to remove so much natural tooth structure to place it, compared to amalgam. The result is a stronger, more stable tooth and a strong, long-lasting restoration. No metal also means no risk of oral galvanism: a condition in which electrical currents are generated in the mouth between different metals (gold and amalgam, for instance). Such reactivity can lead to migraines, chronic pain and other health issues. We believe in using the best materials for our patients and planet. By practicing mercury-free and metal-free dentistry, we support the health of both your body and our planet. For more information, or to schedule an appointment, contact our office today.